46/365 – “Habemus Papam” nr.18, a photo by Luca Rossini on Flickr. 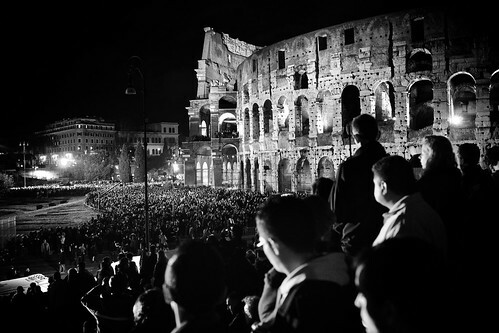 Thousands of people gathered under and around the colosseum for the annual Via Crucis (the Way of the Cross), the first one celebrated by Pope Francesco. I’m amazed by the amount of people, from all around the country and the world, that this city seems to produce at any appearance of the new Pope. The Via Crucis commemorates the crucifixion of Jesus Christ and the path he had to walk to bring his own cross till the top of the Golgota hill, where he would have been executed. Since the sacrifice of Jesus (and his subsequent resurrection) is the heart of the Cristian religion, the Via Crucis is probably the most important of the Cristian celebrations, and Rome hosts several of them all around the city. But the most crowded and scenographic is surely the one at the Colosseum, celebrated by the Pope himself and broadcasted worldwide. The whole area around the Colosseum gets beautifully lit, while the Pope and the cardinals sit over the hill of the Tempio di Venere e Roma (temple of Venus and Rome), one of the finest Roman ruins in the city which faces the Colosseum. I don’t know how it is possible, but in all the years I lived in this city (which are more or less twenty eight), I’ve never attended this incredible celebration. 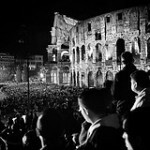 The crowd was the usual mix of Roman devoted, priests and nuns, pilgrims, and tourists. Pope Francesco didn’t miss the opportunity to send one of his renewing signs to the world, by having three Lebanese writing the reflections on the evangelic texts, and finally by closing the celebration with just one sentence: “God’s response to evil in the world is the cross of Christ – a word which is love, mercy, forgiveness”. Which I think it means: we all suffer, let’s just help each other like brothers and sisters do, forgive our mistakes and weakness, and have mercy of those who are in trouble. Should we all do that, this world would be a much better place where to live and die. One of my favourite buildings, with a great atmosphere around it, I love it!